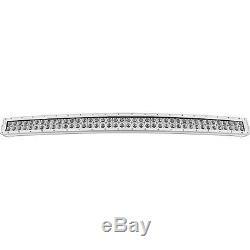 PROMAXX LEDM240CURVED 40In Curved Marine White Dual Row Light Bar 3D Reflector. Whether it be for your off-road vehicle, marine application or any heavy machinery equipment where increased lighting is needed, ProMaxx light bars will help improve your nighttime conditions for increased productivity. Made of lightweight die-cast aluminum. With heat sink extrusion, polycarbonate lens, easy mounting hardware. 30,000-hour working lifespan of continuous use. Sizes: 40-Inch; Marine (White); Dual Row; Curved. ProMaxx Automotive offers quality aftermarket accessories at great prices. ProMaxx Automotive Accessories are available exclusively through Meyer Distributing Authorized ProMaxx Retailers. Our maxim is to provide value-driven auto accessories that focus on quality, affordability and functionality to satisfy a wide variety of needs. It all depends on where our products are when you place your order. The final charges appear at checkout. Important things to keep in mind. We also can't deliver to APO or FPO addresses. After you've completed checkout, you can review these charges on the Order details page. WUnderCarParts wants every customer to be completely satisfied with their order. For most items we carry, we offer a 30 day return period. We want to know why you're returning the product, and if there's a mistake on our part, we'll do the necessary correction to guarantee your satisfaction. We're always willing to work with you to provide a fair and speedy resolution to any issue. WUnderCarParts is one of the top emerging online retailers of automotive parts and accessories in our day. With over 10 years of experience in the automotive replacement and aftermarket parts industry, we strive to bring you the highest quality products from the most trusted brands, all at the lowest prices guaranteed. Whether you are a dealer, end-user, off-roader, racer, hauler, or daily driver, wUnderCarParts has the parts you need at the prices you want. We are a Detroit, Michigan based company, birthplace of quality American Auto. Our mission is to have a company that provides the very best product in our industry and elevates the auto parts online purchasing experience in the eyes of the general public. Our mission is to offer you the lowest possible pricing on every product we endorse and to always attempt to deliver them to you free of charge and in a timely manner. Our mission is to provide an environment in which you will grow, prosper, enjoy, and fulfill your potential in order to accomplish our missions to our shoppers and visitors. The item "PROMAXX LEDM240CURVED 40In Curved Marine White Dual Row Light Bar 3D Reflector" is in sale since Wednesday, October 07, 2015. This item is in the category "eBay Motors\Parts & Accessories\Car & Truck Parts\Lighting & Lamps\Light Bulbs\LED Lights". The seller is "wundercarparts" and is located in United States. This item can be shipped to United States, Canada, United Kingdom, Australia, Mexico, Germany, Japan, Denmark, Romania, Slovakia, Bulgaria, Czech republic, Finland, Hungary, Latvia, Lithuania, Malta, Estonia, Greece, Portugal, Cyprus, Slovenia, China, Sweden, South Korea, Indonesia, Taiwan, South africa, Thailand, Belgium, France, Hong Kong, Ireland, Netherlands, Poland, Spain, Italy, Austria, Russian federation, Israel, New Zealand, Singapore, Switzerland, Norway, Saudi arabia, Ukraine, United arab emirates, Qatar, Kuwait, Bahrain, Croatia, Malaysia, Brazil, Chile, Colombia, Costa rica, Panama, Trinidad and tobago, Guatemala, Honduras, Jamaica.